Year-round our landscaping services are focused on providing environmentally friendly alternatives in our landscaping designs, installations and the products we use. This year, we’re taking it a step further by offering eco-friendly de-icer with free delivery to those in our St. Louis service area. Homeowners are able to purchase a reusable 50 lb. bucket and as many bags as requested throughout the winter-time. Large property or business owners can get special pricing on 36 or 49 count pallets, and all orders include free delivery (within our service area only). Lasts 4-6 Hours (traditional ice-melts last only 1-2 hours). Plus, the lime green color is very easy to see. Keep your walkways, driveway and parking lots safe for visitors with an environmentally friendly de-icer that’s safe for you and your pets. 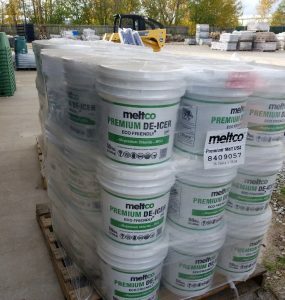 Ice melt bags start at $35.36 with pricing on pallets available by calling our office at 314-657-7050. You can also get extended winter services like snow plowing, ice control or holiday decorations by Quiet Village Landscaping.